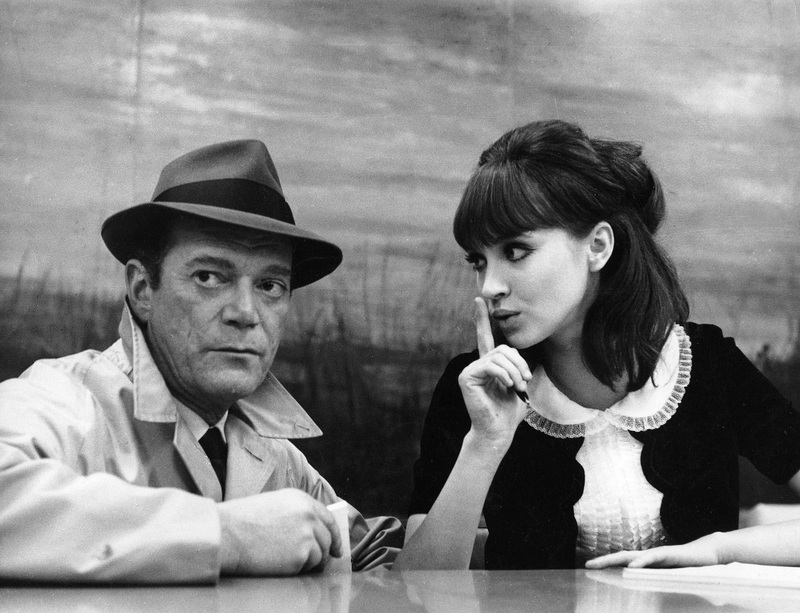 If you find yourself in the LA area this weekend and want to treat yourself to rare, cinematic history, wander down to Landmark’s Nuart theatre to catch Jean-Luc Godard’s ALPHAVILLE. 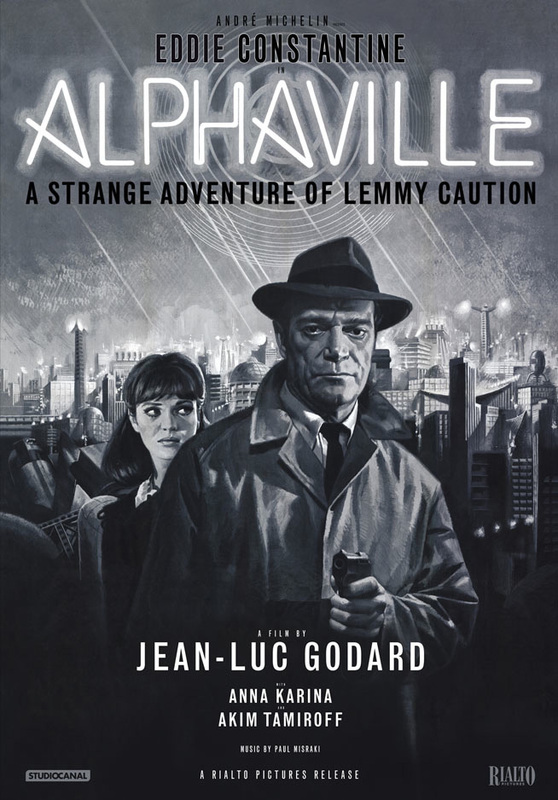 I don’t know how many can say they’ve seen a French New Wave sci-fi film noir movie, and for that reason alone, ALPHAVILLE is unique and worth checking out. 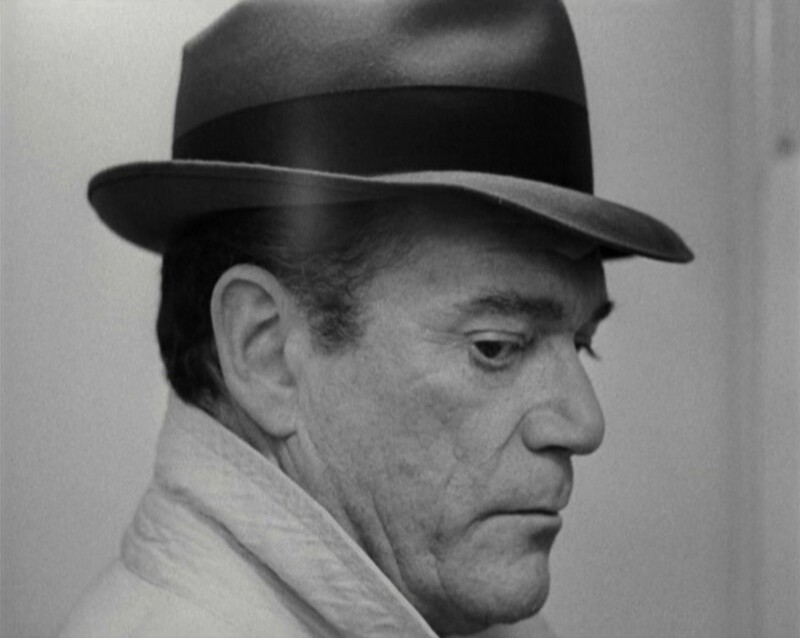 The movie came out originally in 1965, and until Rialto’s brand new DCP restoration of the print, ALPHAVILLE had been practically lost to audiences. Jean-Luc Godard is widely regarded as one of the finest filmmakers ever, and at the very least, easily one of the most influential, thanks to his part in the La Nouvelle Vague (or New Wave). He’s known for innumerable films, like PIERROT LE FOU and BREATHLESS, and with ALPHAVILLE, he presents a neo-noir version of the future, or “A strange adventure of Lemmy Caution,” which is literally the name of the main character, played by ex-patriot American actor Eddie Constantine (THE LONG GOOD FRIDAY, EUROPA), dressed like Humphrey Bogart. I wouldn’t say the themes and philosophy of ALPHAVILLE are subtle, as Lemmy drives into town (from the mysterious “Outlands”) in his Ford Galaxie, posing as a reporter in order to destroy the nefarious super computer Alpha 60, created by Professor Leonard Nosferatu, AKA Leonard von Braun (Howard Vernon). Within moments of arriving in town, it’s clear this isn’t your normal metropolis, as words are continually removed from the Bible/Dictionary (like George Orwell’s Newspeak in 1984), becoming words, feelings, emotions that society can no longer articulate without retribution. Citizens are executed for illogical behavior, like a husband crying after his wife’s death. No one asks “Why?”, and everyone responds “I’m fine thanks, don’t mention it” to practically everything. Oh, and because this is a sci-fi movie in the 1960’s, there are still women around only to satisfy the sexual whims of man (some referred to as a “Seductress Third Class”) . 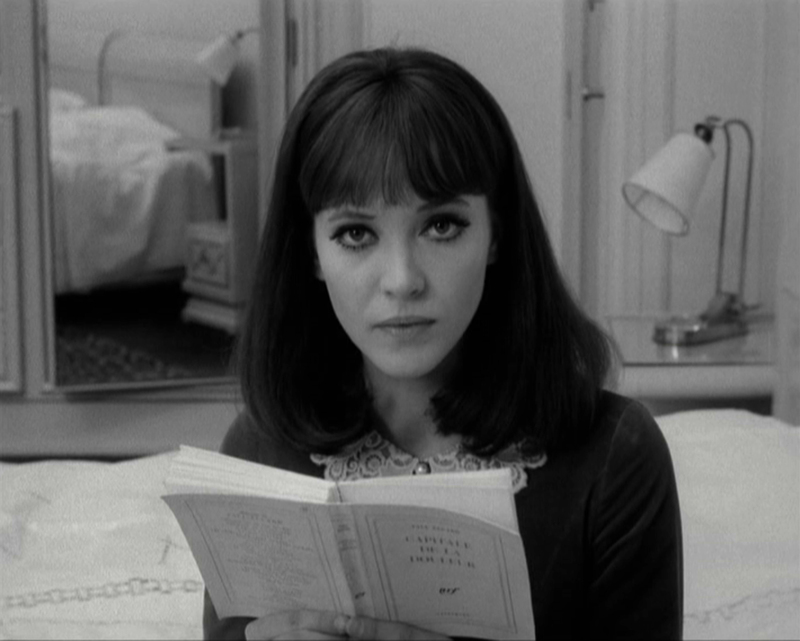 Luckily, Lemmy Caution only has eyes for one woman, and who can blame him when that woman is Anna Karina (above, and forever in our hearts), Godard’s muse and wife (she famously refused to be naked for a cameo in BREATHLESS when they first met, and married one year later). Karina plays Natacha von Braun, your prototypical femme fatale with conflicting, mysterious and potentially dastardly allegiances, thanks to being Professor von Braun’s daughter. They fall in love…or maybe not…as the machinations of the plot have become all too familiar to audiences nowadays, but in 1965, this was heady, powerful stuff. The idea that a society could be ruled by a malicious computer was only just infiltrating our conscience. Nigh fifty years later, we’re still fascinated by artificial intelligence, with mixed results (hello, TRANSCENDANCE). 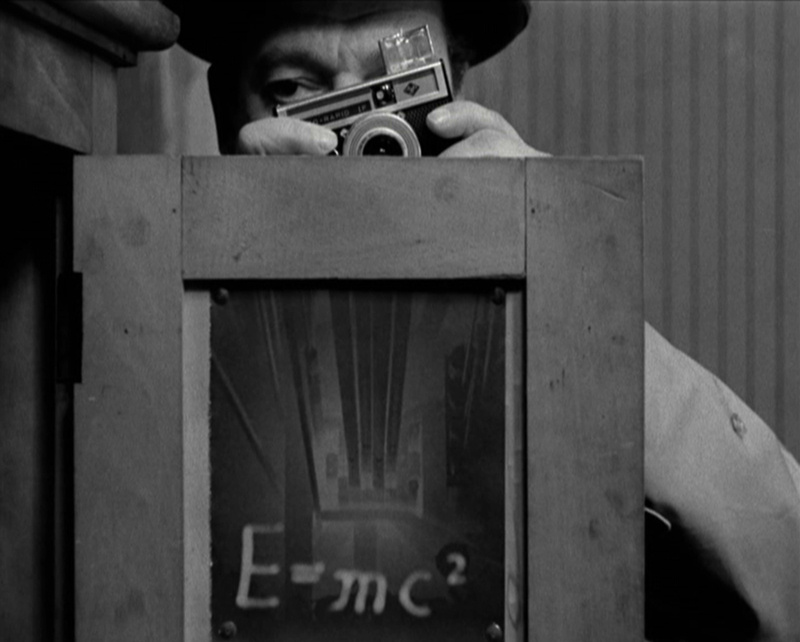 Thanks to the restoration and the suffocating, shadowy black and white footage, ALPHAVILLE is beautiful to look at, with some truly fantastic camera work. Because Caution is posing as a journalist, he’s continually taking flash photography, an over-the-top, but effective way to jolt the audience, to flood the proceedings with bursts of light, to uncover the sinister underpinnings of this dystopian world in which the individual self has been torn asunder long ago. In going undercover as a reporter, Lemmy becomes one, displaying devotion to a journalist’s primary objective: revealing the truth. The imposing and foreboding voice of Alpha 60 absolutely sounds like the bounty hunter Boushh (the one Princess Leia disguises herself as in RETURN OF THE JEDI to save Han Solo), or Boushh absolutely sounds like it, as ALPHAVILLE drips in BRAVE NEW WORLD-ian mood and tenor, buoyed by a crescendoing score from Paul Mizraki. Unsurprisingly, ALPHAVILLE is bizarre, confusing and bewildering throughout (read: over my head; this is a New Wave film from Jean-Luc Godard), but the central motifs are ones we’ve seen in science fiction often in the fifty years since this film first was made, and make for a worthy sojourn to the cineplex, should you have the opportunity to see it. For more information on Rialto’s DCP restoration and the film itself, check out their website. If you’re not in the LA area and still want to take in this picture, you may still be in luck! ALPHAVILLE is traveling across the country at select theatres. Here’s the schedule. ALPHAVILLE opens Friday, April 25, 2014 at Landmark’s Nuart Theatre, showing through Thursday, May 1, 2014 for an exclusive one-week engagement. Showtimes are Fri-Mon: 12:00, 2:30, 5:00, 7:30 & 9:50; Tues-Thurs: 5:00, 7:30 & 9:50. Landmark’s Nuart Theatre is at 11272 Santa Monica Boulevard, just west of the 405 Freeway, in West Los Angeles. For more program information, call 310-281-8223. Check out Landmark’s website today. Tagged A Strange Adventure of Lemmy Caution, Akim Tamiroff, Alphaville, Alphaville restoration, Alphaville restored, Anna Karina, Eddie Constantine, French New Wave, Henri Dickson, Howard Vernon, Jean-Luc Godard, Landmark Theatres, Lemmy Caution, Nuart Theatre, Prof. Leonard Nosferatu aka von Braun, Professor Leonard von Braun, Rialto Pictures.